though, it is harder to teach old dog owners new tricks. Take the case of dog collars and dog harnesses. There have been many things said and written about the advantages of using dog harnesses instead of collars to control dogs, yet many still cling to the old habit of using dog collars. So let us take a crack at explaining the disadvantages of collars and the advantages of harnesses. Although we have been using dog collars for the longest time to control and restrain our dogs, it has also been found to be a restrictive, painful and even hazardous way of doing it. after all, the restraint is attached around the dog’s neck. That’s basically like putting a noose around the dog. When using a dog collar the constant pulling and tugging motion continually twists the neck uncomfortably. In some cases, dog owners attach the collar too tight, which puts too much pressure on the windpipe and restricts blood flow aside from causing constant pain. We don’t even want to talk about choke collars and collars with metal spikes called prong-collars, which are clearly inhumane methods of control and restraint. At best we see dog collars as a means of identification since we can permanently attach dog ID tags on the collar. Other than that, we believe the harness is a better alternative. Let us explain why. Body harnesses are becoming more popular and for good reason. The harness itself is usually secured around the dog’s body as opposed to collars, which are secured around the dog’s neck. They are generally designed based on studies of dog anatomy and movement. They are usually fitted with protective paddings for comfort but more importantly to protect the dog from harm or injury at pressure points. The main goal of harnesses is to avoid putting pressure on the vital parts of the dog’s anatomy, which are usually hit when using a collar, such as the airways, nerves and veins. By far they are the safest and kindest method of retraining or controlling dogs. They work in the same manner as the safety harnesses some parents use on their kids when in open public spaces. If people are willing to use these harnesses on very young kids to keep them secure and safe then they are probably ok for dogs. Like any device we wear for protection, knowing what to use and how to use it is very important. There are different kinds and many brands of dog harnesses out in the market and choosing the right one for your dog is very important. Although the are many kinds of dog harnesses we can basically categorize these in to 2 types, nylon strap harnesses and webbing harnesses. These are the simplest yet very useful dog harnesses. Their basic design is very similar to the ones we use on human kids and they were probably based on it. They are also probably the original or first generation of dog harnesses. However, even though they are the oldest design, this does not mean they are out of date. They work very effectively especially since it’s makers have been perfecting the design based on experience. 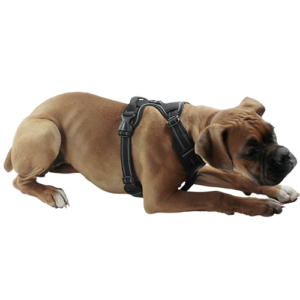 Some are made to follow the dog’s body shape and movements so that the harness will exert pressure on certain parts of the dog to prevent them from continuing to put pressure on these parts. 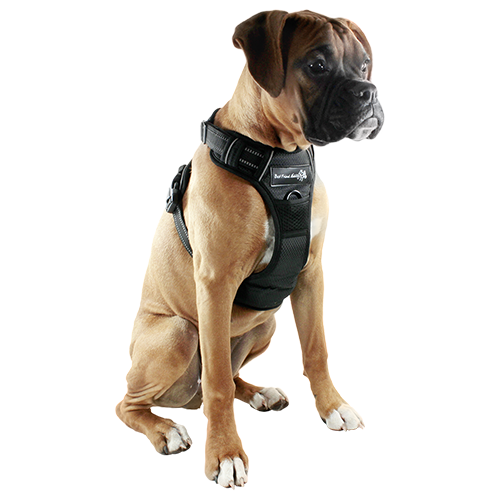 This ensures that the dog is always in proper position and will follow your coaxing by controlling the harness. If used properly these can be effective in keeping dogs secure and controlled while also keeping the safe and comfortable. A widely popular harness in recent years, vest harnesses are sturdier and more robust type of harness. They are designed based on the harnesses used for horses. They are usually made of thick nylon webbing with sturdy plastic snap on buckles to secure everything in place. There are also other slots or straps built into the straps for additional functions. For example, there is usually a thick strap of webbing located on the center that serves as a handle, which can be used when you need to lift the dog easily and comfortably like when putting them in and out of the car and the like. Some have slots and straps for attaching to car seatbelts. Harnesses also have an added advantage over collars when it comes to added functionality. 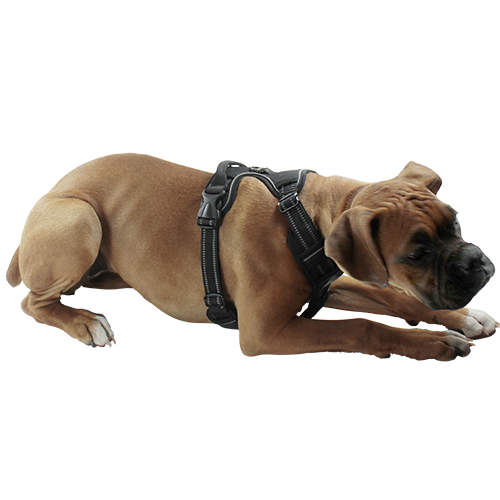 Harnesses can be fitted with a variety of useful as well as ornamental items. 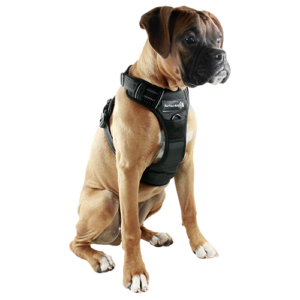 For instance, some harnesses can accommodate reflective straps along the sides so the dog can easily be seen in dark conditions and they can also be fitted side bags for carrying small items among other things. With all these benefits for you and your dog, switching them from collars to harnesses is definitely a smart choice.